On Thursday, November 8th, Trinity College School hosted the 78th annual Toronto Branch Dinner at the Royal Canadian Military Institute. Close to 100 alumni from the classes of 1947 to 2015 attended, as well as many current and former staff members. The meal was incredible, as was the atmosphere. After an update on the School, Headmaster Stuart Grainger presented an alumni scarf denoting honorary Old Girl status (in recognition of 20 years of service to the School), to athletic therapist and Rigby Housemaster Tanya Beck. Also honoured was newly retired Head of the Junior School Barbara Winsor Piccini, who received the Toronto Branch Medal for her outstanding service to the School. Special thanks to the class of 1982, who had 12 classmates in attendance, and especially Richard Murphy ’82, who won the 50-50 draw and donated the proceeds to the John H. Bassett ’82 Memorial Bursary. 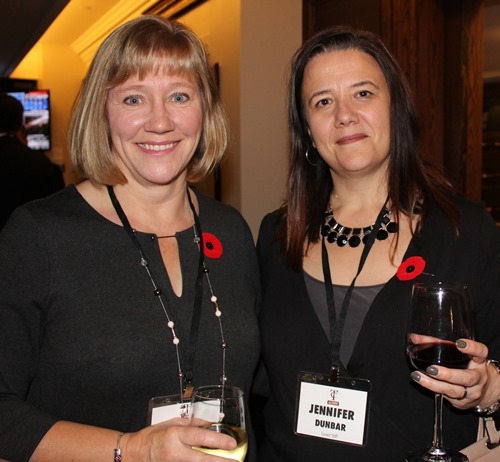 View the 78th Toronto Branch Dinner gallery for more photos.